ANNAPOLIS, MD (December 9, 2010) – Mulberry paper is considered the “granddaddy” of all art papers. It has a neutral pH, and feathers beautifully while torn. The timber is useless, but the inner bark has been used for centuries to produce high-quality art papers, and once imported into Polynesia, it became the fibers for tapa cloth. The Chinese created the first example of a true “paper” (as opposed to parchment, hides, and papyrus) from the tree around 2,000 years ago, shaping world history. But did you know it can be causing your allergies, too? The male trees produce levels of pollen that experts say are among the highest in the world, and you may not want to visit Islamabad between February and April, where these exotics were also planted widely as street trees. "This causes one of the most severe forms of pollen allergies ever documented, due to which many people have died," said Mohammad Osman Yusuf, a prominent Pakistani allergy and asthma specialist. So as you plan for spring around your landscapes, you may want to take the winter months to destroy a few paper mulberry before they bloom this spring. Not to mention that the paper mulberry aggressively displaces native vegetation, consumes high levels of water, breaks cinder blocks and pipes, and is easily uprooted onto your houses, paths, roads, and other forest trees. For these reasons, paper mulberry has been chosen as the MISC Invader of the Month for December 2010. Paper mulberry (Broussonetia papyrifera, syn. Morus papyrifera L.) was introduced to the United States in 1903 as a fast-growing ornamental shade tree. Paper mulberry threatens ecosystems by physically displacing native species, and consuming high volumes of water. The roots are quite shallow, which can lead to wind-throw and uprooting, yet the roots are strong enough to break cinder blocks and damage buried pipes. Trees can form dense thickets by spreading vegetatively from roots, and its vigorous growth can out-compete native trees for light and nutrients. 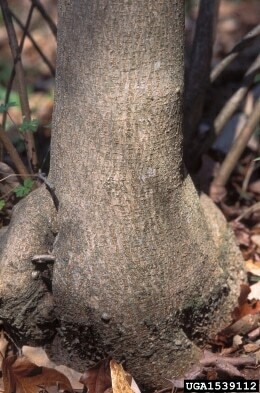 Root suckers can emerge up to 75 feet from the main tree, expanding the impact of this plant. 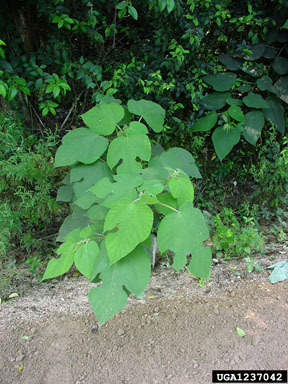 Paper mulberry can grow 30-45 feet tall. It particularly likes disturbed areas, like forest edges, fields, and roadsides, but can also invade canopy openings within undisturbed natural areas. Paper mulberry is native to Japan and Taiwan. In the United States it occurs from Massachusetts to Florida, and west to Illinois and Texas; it is invasive in 28 states, and over 12 countries. Paper mulberry differs from another exotic mulberry (white mulberry) and a native mulberry (red mulberry) in its white fuzzy leaves, and fuzzy reddish-brown twigs. Leaf sizes range from 3 to 10 inches in length, and are arranged alternately on stems or whorled. Smaller leaves tend to be simpler, ovate in shape with pointed tips and serrate margins. Larger leaves tend to be heart or mitten-shaped, some deeply lobed, with three large or sometimes two smaller lobes near the base of the leaf. Soft, pubescent hairs are found on the underside of leaves. If leaves are damaged or removed from the stem, a milky sap exudes from the cut surface. In the spring, female trees produce a globose fruit, while male trees produce a catkin, which is responsible for the pollen that causes allergies. The mature female fruits are edible and are spread far by wildlife. Paper mulberry should be kept out of cultivation. Existing populations will continue to expand, and seeds can be spread by wildlife. As with most cloning tree species, basal bark treatment will be most effective; apply herbicides prior to seed set. Small seedlings can be pulled by hand. The bark exudes a heavy sap that can ruin clothing.